It’s Throwback Thursday so let’s go back through Upper Deck’s trading card history and come up with a fun giveaway. The Anaheim Ducks played against the Buffalo Sabres last night and kept their winning streak going with a 4-1 win over the Sabres. Aside from the streak they have been on, Corey Perry lit up the ice with his second hat trick of the season, seventh overall! So let’s put up a throwback card and see if our fans can come up with some great captions for the card! Please share your comical caption to this card for your opportunity to score five packs of 2014-15 Upper Deck NHL® Artifacts Hockey Cards! You have until Friday morning, October 24th at 8:00 a.m. PT to post your caption before this promotion is closed. These fans have no clue how stinky hockey gloves can be and they still want a high five! HIGH FIVE, My name a Corey Perry I like you, I score goals! Jinque! Love it when my parents watch me practice! He He He . . . they Really Think I’m Corey Perry! Silky Smooth hands? I got them right? “Ted, I promise tonights hockey game will be..LEGEN…wait for it…DARY. LEGENDARY! Hi guys, this never gets old even if I do. Love you fans and your hands, go Ducks. Hey friend, do you know you have 2 right hands. A little weird but thanks for the support. I should have been a wrestler! Man did I get lucky today! Ohhh man…It doesn’t look like this fan washed his hands! I love how I score more goals than Getzlaf gets girls. Sure, I’ll give you a high five! Thanks! I know I’m better looking than Getz, so yes, I’ll shake your hand. 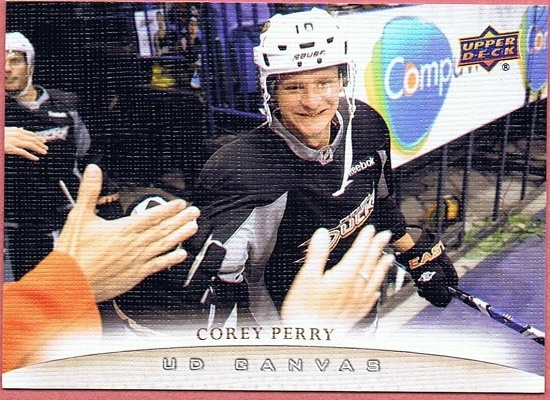 For the last time, my name is Corey Perry, not Katy Perry…. I have never seen a guy with TWO RIGHT HANDS before! Do they want a hug or a high-five? Congrats to Al K.! Your witty comments have scored you 5 packs of 2014-15 Upper Deck NHL® Artifacts Hockey Cards! Thank you to everyone for participating and we look forward to seeing your comments again soon. I Know The Contest Is Over But I’ll Submit One Anyway!! !